The Walking Bostonian: "There is a very strong element of psychology behind traffic patterns." "There is a very strong element of psychology behind traffic patterns." It was supposed to be a traffic nightmare. It turned out to be a dream. Predictions of five-mile backups and unprecedented delays on the New Jersey side of the George Washington Bridge appear to have scared thousands of daily commuters away from the span. Except for the recent congestion caused by superstorm Sandy’s assault on the region’s transit system, motorists have seen faster-than-normal rush-hour commutes ever since the July start of a major construction project in New York City, according to transportation officials, experts and traffic data. In the last few years, he said, similar worst-case warnings in Los Angeles, Seattle and London have had the same effect — actually reducing traffic to below-normal levels on roads that were expected to be clogged. It’s a public relations strategy that state transportation officials in New York, who aired the predictions in media outlets throughout the region before the July 15 start of the project, acknowledge opens them to “cry wolf” criticism. But they say there was no effort to mislead the public and that the backups might have matched predictions if people hadn’t changed their routines. At 8 a.m. on a typical weekday, it takes 11 to 13 minutes on average for a vehicle to travel eastbound from the intersection of Routes 80 and 95 in Hackensack to the deck of the George Washington Bridge, according to INRIX. But in the months from the start of the Alexander Hamilton Bridge project until Sandy struck, that drive took an average of between four and six minutes. There were nearly 6,400 fewer daily Manhattan-bound trips on average in the 2.5 months after the July 15 start of construction, compared with the period in 2011, according to officials at the Port Authority of New York and New Jersey, the agency that operates the GWB. They also said the warnings appeared to be the cause. The Lincoln and Holland tunnels, the Port Authority’s other Hudson River crossings, meanwhile, saw no appreciable increase in traffic over that time, said Steve Coleman, a spokes¬man at agency. I'll note that while the original over-hyped, alarmist coverage of the closure was widespread, the follow-up report was buried and barely noticed. Obviously this fits well with their public relations strategy if they are intentionally raising the alarm in an effort to manipulate traffic patterns. It wouldn't do for the public to grow wise to their scheme, would it? But as a result, the public still believes in doomsday predictions when it comes time to discuss the closure of collapsing highways and outdated overpasses. Cries of "gridlock!" and "nightmare!" fly at public meetings. Local residents form a sort of "Stockholm Syndrome" attachment to the 1950s era infrastructure which mutilated their community. There's a great fear of bringing the roadways back to human scale because the supposedly trustworthy officials have spent so many years scaring the public with outlandish claims of impending disaster. At other meetings, folks stand up and protest against new development -- housing that is so desperately needed, commercial space to attract more jobs -- because they were told it would "worsen congestion." The consultants are stifled by their very own ridiculously oversimplified "level of service" metric which labels intersections with "A" to "F" letter grades. The residents want to know why the wonks aren't doing their homework well enough: surely they could get a better grade if only they put in the effort? In both cases, we need more honesty from traffic engineers and city officials in charge of transportation. The first step is to make it clear that "Traffic is NOT like water." There is no "strong element of psychology" dictating how water flows, so that analogy simply breaks down. The honesty starts when traffic engineers stand up and admit that motorists adapt to real world conditions, that there are complicated feedback processes which are extremely difficult to model, and that it is not an exact science. Traffic engineers need to admit that the letter grades given out by "level of service" are extremely misleading. What the grades really measure is the volume of cars using the roads and intersections, not the amount of "work" that an engineer does. They can tinker around the margins but the core cause of an "F" grade is that there are too many cars trying to get through that space. There is only one way to accommodate all those cars: increase the number of lanes. This is how "level of service" was often used in the past: to justify the widening of roads, the creation of grade separations, and the destruction of the communities around them. In many cases, the road widening induced even more demand than before, leaving the area just as congested and more miserable than ever. Since road widening is no longer acceptable in urban communities, there is only one other choice available: to manage demand. Instead of holding communities hostage to dictated traffic projections, often based on false premises, the communities need to turn that around and stake out what street design is acceptable and what is not. Then the traffic engineers come in as public servants, not masters, and make the safest, best use of the allotted space. Streets are supposed to connect communities, not divide them. Demand management goes further than that. Unintentionally, the officials in New York have demonstrated a certain principle: If you increase the perceived cost of a particular route, then traffic will decrease on that route. In the case of the Alexander Hamilton Bridge closure, the officials went out of their way to scare people into thinking that there would be an increased "time cost" for going over the George Washington Bridge. It worked. But we don't need to create crises to manage demand. There's a natural way to do it, the same way we manage demand in nearly all other contexts: putting a price to valuable road space. It's been demonstrated to work well in London, Stockholm, and Singapore, as well as other places. And it's the only real solution to congestion. There's other tools in the demand management box: designing streets so that people feel comfortable walking or biking instead of getting into a car; improving public transportation; building communities where distances are at human-scale instead of at automobile-scale; and reducing the number of parking spaces. These strategies don't directly attack congestion the way road pricing does -- and may not appear to reduce congestion at all. But they do enable more people to live and get around without struggling constantly against congestion. 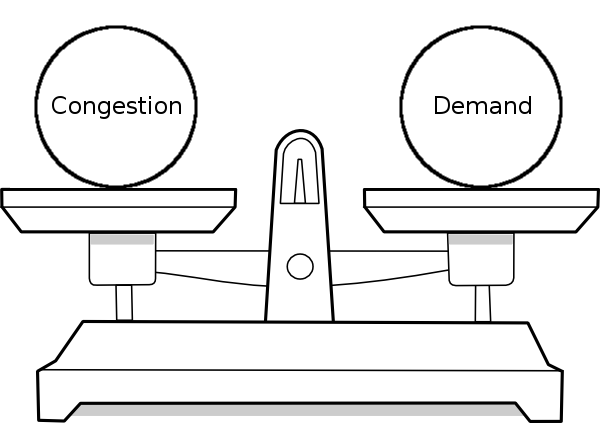 It is generally not possible to "solve congestion" non-destructively without demand management, in an urban environment. The reason is simple geometry. In a city, most any destination of significance will attract more people than roadways could handle if they all came in cars. There just isn't enough space. The cars that do attempt to come will quickly fill up the available space, and people will call it congestion. It will be congested if few people walk there, and it could still be congested even if most people walk there. Because as long as the demand exists, available slots will be filled with cars, no matter how well the roadways are designed. These days, most large projects filed with the BRA include a "Transportation Demand Management" section. They tend to use similar language (copy-n-paste is my bet) and say nice things about getting their employees to walk, bike or use transit. And it's all well and good to get people thinking about this. Developers claim the standard is to "mitigate their own impacts." But individual developers can't do much. They are usually asked to tinker with signal timing at nearby intersections, or redesign some street flows. But that can only go so far. Real action has to be taken at a larger level; maybe community-wide, maybe city-wide, maybe even region-wide. This is because the key factors driving road demand are coming from those levels. For example, zoning rules which dictate "minimum parking requirements" cause traffic to increase in the vicinity of new developments. Zoning rules which force communities to sprawl cause people to use their cars more. Zoning rules which make for miserable streets discourage walking. The construction or widening of a nearby highway induces additional demand on the roads leading to that highway. The deterioration of public transportation forces people to resort to automobiles. And the implementation of road pricing will have to come about through action by elected officials and activism by local advocates. The first step is honesty from the experts and the transportation officials serving us. The answers are not easy. Many won't want to hear them. But we should demand them. Thank you for this post. 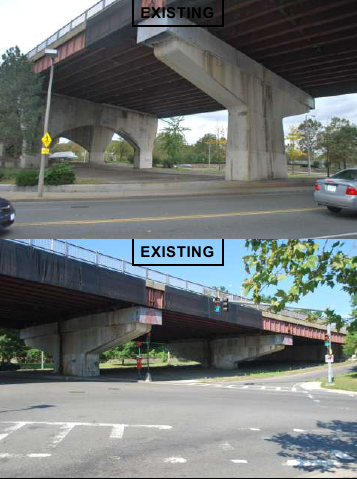 As a Forest Hills resident I'm getting really sick of the Chicken Littles who are basically trying to sabotage the Casey Arborway design process with their constant fear-mongering.